Chocolate on top of chocolate with a sprinkle of more chocolate. That is how I like my cheesecake! 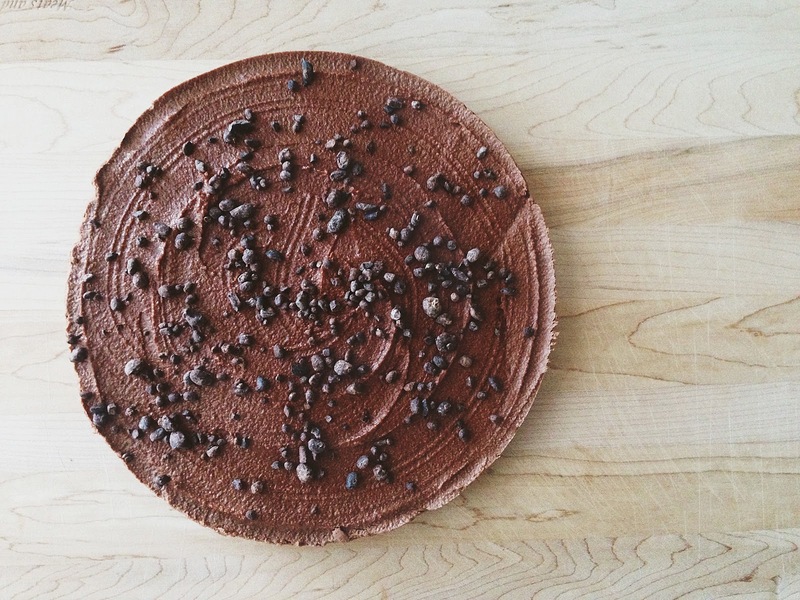 There are seemingly endless combinations of goodies you could add to a chocolate cheesecake. Layers of caramel, chocolate, and nuts. Maybe even some raspberry sauce to top it off, or peanut butter swirled in the rich chocolate batter. However, I decided to keep it simple and stick with good old fashion chocolate. Makes one 9-inch cake in a springform pan. Raw cacao nibs for sprinkling. Begin by covering your cashews with water in a bowl to soak for 4-6 hours earlier that day, or the night before, you wish to make the cheesecake. After the cashews have soaked, begin to make the cheesecake by greasing a springform cheesecake pan (or muffin tin if making mini cheesecakes) with coconut oil. Set aside. Next, make the crust by processing the almonds in a food processor until they resemble a coarse meal. Add the cinnamon and raw cacao, and pulse to incorporate. Add the agave and water one tablespoon at a time until the mixture is sticky when pinched with your fingers. Press the crust into the prepared pan. Rinse the food processor bowl and blade. Now begin making your filling by draining and rinsing the soaked cashews and adding them to the bowl of the food processor. Add the water and process until the mixture is smooth and creamy. Now add the agave and coconut oil. Process for about 15 seconds, then add the cacao powder and cinnamon and process until the filling is a smooth and creamy chocolate filling. Scrape down the sides and continue processing as needed. Smooth the filling over the crust in your prepared pan, sprinkle with raw cacao nibs, cover and freeze for 2 hours before slicing to serve. Keep leftover cake stored in the freezer in an airtight container, and let it thaw at room temperature for 10 to 15 minutes before slicing and serving. I love the simplicity of your blog and the simplicity of this dreamy dessert. Thank you so much <3 I really appreciate it! I would recommend waiting to get raw cacao - but raw carob would probably be okay too! I haven't tried it so I can't say for sure though! I just fall into your blog and I love it! Posted it on my facebook account too. 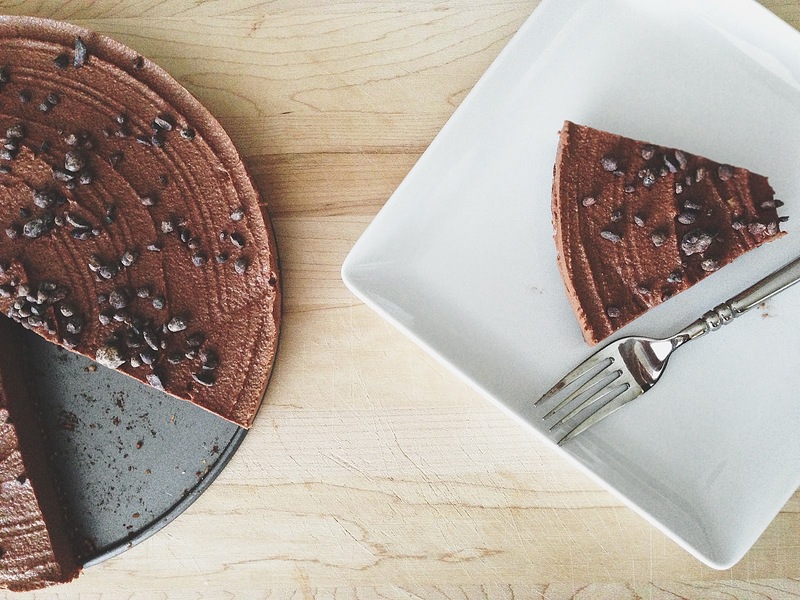 Your recipes look fantastic, I'll once make/have your chocolate cheese cake *yumyum*. Greetings fromBerlin (Germany). Wow thank you so much! 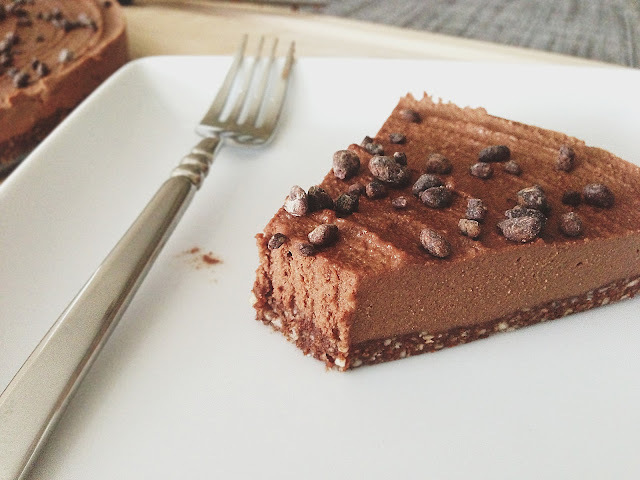 I hope you get to enjoy this recipe too, it's a goodin' =) Greetings from the US as well!